Where did you grow up and how did you get into cycling? What was your junior racing career like? I grew up near the Jersey shore and started racing in the early '80s. The '80s have often been called the golden age of junior racing in the US. Bigger junior races often sold out, and it was nothing to have fields of up to 100 juniors. 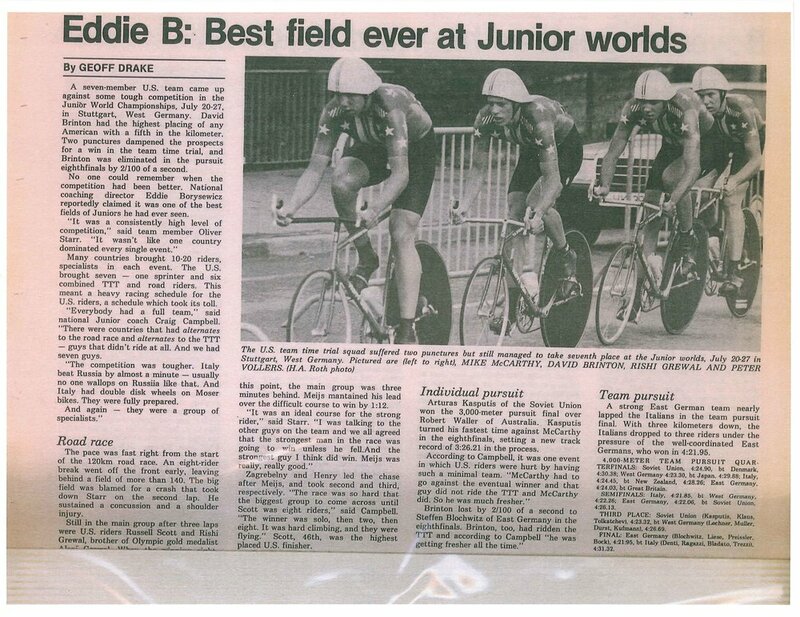 I had some good results as a younger rider which led to a spot on the famous Getty Junior Team. I won the NJ state road championships in 1984 as well as the Schiff Vitamin Tour of Connecticut Stage Race and that led to an invitation to the USAC (USCF then) winter camp at the OTC in Colorado Springs. After placing second in the camp testing, I was invited to become a permanent resident at the OTC, so I came home after the camp and flew right back in January 1985. It was there that racing buddy Mike McCarthy told me about a new GS Mengoni Junior Team that was being created to compete with the new 7-Eleven Junior Team and Mike asked if I wanted to join. I jumped at the chance. Later that year, I earned a coveted spot on the US Junior Worlds Team and competed in both the road race and Team Time Trial at the Jr. World Championships in Stuttgart, Germany, placing 7th in the TTT with Mike, Rishi Grewal, and David Brinton after suffering several flat tires on our state of the art "funny bike" TTT bikes. I have nothing but the fondest memories of my junior racing days and that experience really helped me during my years coaching the KMS Jr. team. I feel like not many people know that you were actually pro for a number of years. When was that, and what teams were you with? How do you think road racing then compares to road racing now? While I raced very seriously from the time I was 17 through about 25, I only had an actual pro license for one year, 1991. That year I rode for the famous IME/Bolla Wines team with Dave Mann, Jeff Rutter, Frank, Mark, and Paul McCormack and Graeme Miller, arguably the strongest team to ever emerge from New England. 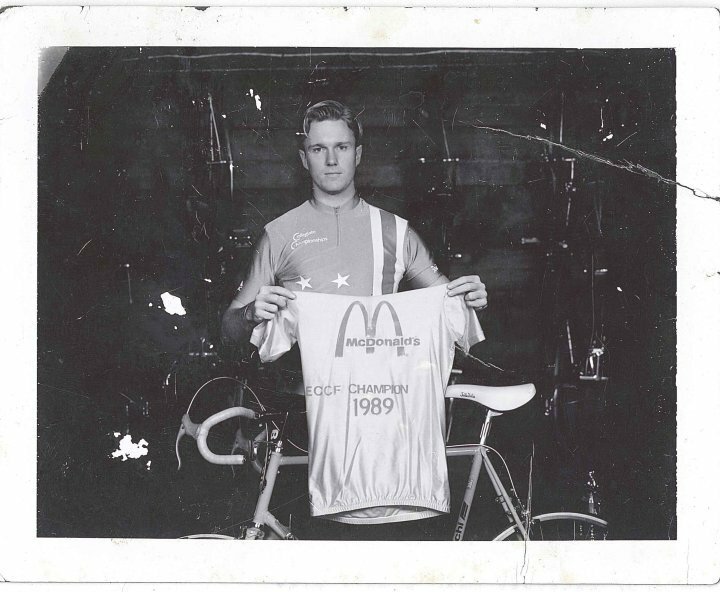 At the time, I had been attending college a semester at a time and had been the '89 Collegiate National Road Champion and silver medalist in '90, so it was a big deal for me to finally be focusing 100% on bike racing. What I learned during that year is that I just wasn't cut out to be a pro. In pro cycling, you're basically only as good as your last result and that gave me a whole new perspective on the value of finishing college and having a normal career. So I went back to Cornell, married Kim, finished my degree in Government and then took a year to apply to law schools. What made you want to move to Vermont? And what happened to your riding career when you did? What was the riding scene in VT like back then as compared to now? It was the 1992 Killington Stage Race. Kim and I were driving through Woodstock on the way to the race and it was at that moment that the idea of moving to VT full time dawned on us. I had been applying to law schools and it was then that I decided to apply to Vermont Law School located in nearby South Royalton. Once accepted, Kim and I made plans to move to Woodstock and Kim, being a UMASS hotel school grad, was quickly able to find a position at the Woodstock Inn & Resort, where she still works, and I ended up finding a job as a law clerk at a local law firm. Riding and racing were very limited during that time period as I was a full-time law student but also working 6-8 hours a day at the firm. I remember doing some collegiate racing, but not much else. Almost all of the local riding back then was on pavement or mtn biking. Pretty much zero gravel riding. Sure, we'd take to the dirt every once in a while, but with super stiff road bikes with 22-23c tires, it just wasn't pleasant. Nowadays my road bike stays on my trainer and we only ride pavement to bridge to the next gravel road. How did you get into gravel riding and what was the story behind it? Gravel riding really grew out of a concern for safety after I had started the KMS junior team. We were doing road rides with 5-8 kids who had little to no riding experience and I was terrified when cars would pass us while training. One day, after a particularly close call, I remember just yelling, "Take the next right, any right!" We ended up on a dirt road and, instantly, I felt the difference. No cars passing at high speeds and, more importantly, the kids could ride together and socialize, at least when we weren't climbing. From pretty much that point onward, we did the majority of our training on dirt roads. We made arrangements with the local bike shop to have all of the kids ride cyclocross bikes as they had bigger tires and lower gears which made all the difference as far as gravel riding comfort was concerned. Peter and Brendan Rhim after he won the 17-18 Criterium Nationals. The team enjoying a winter ride. How does Vermont Overland fit into this timeline? When did you start it and what were your original goals for the company? I started VO in 2008 with a Land Rover enthusiast buddy of mine. We had discovered the wonderful network of Class 4 (unmaintained) roads we now lovingly refer to as Vermont Pavé and wanted to share the experience so we founded VO as a bespoke weekend 4x4 guide service. Once I started coaching the KMS team, the guide service was shelved, but we did end up developing a partnership with Overland Journal to help them run their Overland Rally & Workshop event in the northeast. 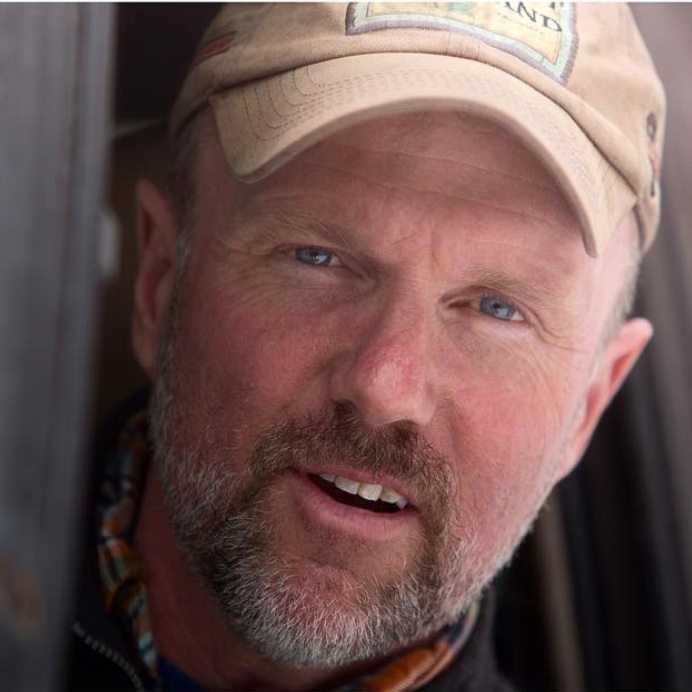 Overland Journal then decided to hand the reins over to VO while keeping a strong affiliation with the rally and, today, the Vermont Overland Birdwatching Safari is still the premier overlanding rally in the northeast region. It was VO's early devotion to Class 4 roads that gave rise to the idea for The Overland bike race. What is the story behind your brainchild, The Overland? What gave you the idea to promote an event like this and what was year one like? How in the world did you get almost 400 people to show up for the first year in downtown Woodstock? Even in the early days of the KMS team, we had started to train on the local Class 4 roads. The team would do a version of the early Overland course stopping in S. Royalton for sticky buns half way through. We often talked about how cool it would be to have a race over these roads. In my racing days, my absolute favorite races were local New England downtown criterium races. There was just nothing more exciting than racing on a downtown course in front of lots of enthusiastic spectators. So we worked with the Village of Woodstock to close Central Street for the day (the words "monumental task" do not do justice to that particular undertaking). While hosting the race in Woodstock was fun, it was not particularly sustainable. Since that time, the event has found home at my house in Reading. Both Reading and West Windsor have been so inviting and gracious in hosting the race. If you were to give other gravel and adventure cycling event promoters advice, what would that be? My main advice is "one group, one course, one shared adventure." So often we see gravel promoters trying to please everyone with multiple courses, multiple categories, and far too many choices for the riders. The one thing that gravel grinding offers in spades is the shared adventure and camaraderie that results from same. The rider that comes in last does the same course and starts the race with Ted King and Ansel Dickey. That's a huge accomplishment for anyone, and it creates a tremendously positive vibe at the finish. How is your 2019 riding season shaping up as of now? Can you give us a hint as to what events you want to attend personally? Looking really good. I try to ride or drive support at almost all of the gravel events in VT, and that's quite a few. VO also hosts a weekly gravel ride from my office which has become a local ride monument. You can now basically ride gravel, mtb or fat bikes all year without ever leaving Vermont! Let's talk Nav. Many people have heard you rant about it and I feel like your ideas are often on the cutting edge of what’s happening. Why do you like it, how do you use it, and why should we all embrace it? I honestly feel that self-nav is one of the most important issues in gravel grinding heading into the future. With so many sports events all over the place, the visual impact on the general public is very real. In our area of Windsor County, some intersections contain a half dozen signs for horse, running, biking, you name it. Further, I've seen gravel rides just ruined by sign sabotage. One sign gets taken at a crucial intersection and you'll have some very upset riders at the finish. Going forward, VO will take a cue from the grandaddy of all gravel grinders, the Dirty Kanza 200, by going entirely self-nav. It's super easy. Just download the course to your phone, set your phone on airplane mode to preserve the battery and buy an inexpensive Bluetooth earbud and you'll have audio directions for the entire ride. Either that or go old-school and ride with cue sheets. The cool thing about self-nav is that it's not only safer for the riders (slows things down a bunch), but it also greatly fosters camaraderie. You'll have whole groups form for the purpose of sharing and confirming nav cues and, many times, the bonds formed during the ride last well beyond it. What is the deal with VOMAR in 2019? People seem to think that it’s been on the guillotine. VOMAR is such a ridiculously epic ride given the time of year (March in VT) that I threaten to bag it every year. But then we get so much positive feedback from it over the winter that I always forget the pain. So back it comes in 2019 and now with the finish line at the utterly fabulous Brownsville Butcher & Pantry! Just roll right into the store at the end of the ride and feast on home-made chili and cornbread and a host of other delights, not to mention local craft beer on tap! If you were to tell people to explore one small town in Vermont, that incorporates great foot, gravel, trails, and nightlife, what would that be? I'd say explore Reading and West Windsor. Fantastic roads, lots of awesome pavé and amazing pre, during and post food and beer choices make these two towns tops for gravel in my book. Loving all of my local nanos: Upper Pass, River Roost, Rutland Beerworks but I really love getting out and tasting beers from all over the state. It's all part of the gravel experience. Coming up, what are you looking forward to and what are your latest projects? GRAVELFEST is the biggie. We've expanded the Overland race weekend into a four-day festival of all things gravel culminating with the Overland on Sunday. Very limited space so don't miss reg opening on New Year's Day at 10 am! In closing, if you were to give riders, event promoters and entrepreneurs a parting piece of guidance, what would it be? Support your local gravel event, whether it's by riding it, working it, voting for it at a town meeting or running one yourself. Gravel grinding is a truly sustainable form of social biking and gravel events are so beneficial for our local communities and the vitality of cycling in general. Lovely people coming together to ride bicycles on picture-perfect back roads and enjoy each other's company afterward. Just doesn't get any better.